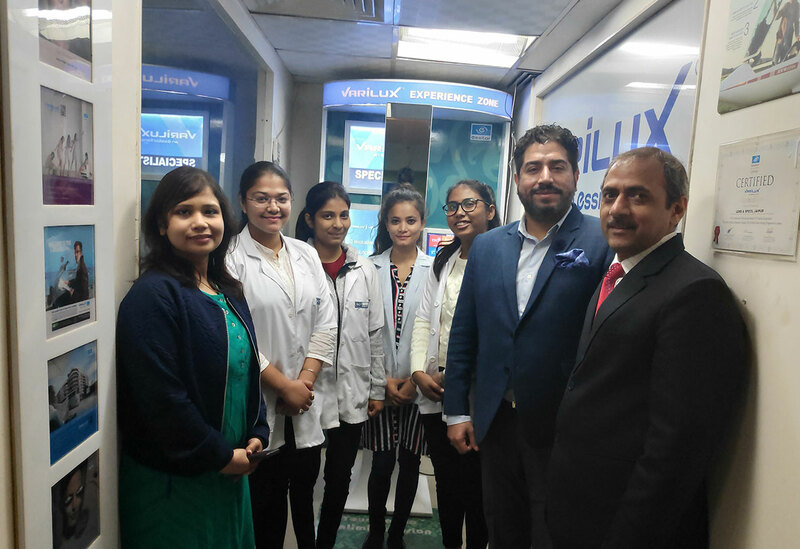 An industrial Visit to manufacturing laboratory of Essilor India Private Limited Okhla Industrial Area New Delhi was arranged on 5th March 2019. Students of Optometry reached the venue at 10.30AM along with Dr. Ashwani Kumar Ghai, Assist. Professor, Deptt of Optometry, SGT University, Gurugram. After a brief introduction about Essilor India Private Limited by Mr. Ankit Sakhuja, Product Manager Progressive Lens North India [Essilor], Mr. Kulbhushan, Professional Services Manager North India [Essilor] delivered a lecture on types of materials used for making spectacle lenses. After having Lunch students were divided into two batches and a guided tour of a laboratory was arranged with Miss Tanima, Key Accounts Manager, Mr. Kulbhushan and Mr. Ankit Sakhuja. Students were exposed to live to manufacture of different kinds of spectacle lenses, their coating, edging and fitting of lenses into spectacle frames. It was a wonderful experience where our students learned how a raw lens slab is converted into a powered lens and then fitted into a frame. At about 4.15 PM the visit came to an end and students started their journey to home.